This topic contains 1,008 replies, has 22 voices, and was last updated by sonic.penguin 5 years, 3 months ago. CURSES! Well, may the best person win! I'm sure they will both be unique, I just have to figure out how to incorporate Fan castle, which I think is in Xiang Yang? Also, can someone give me the order of how the 4 counties were conquered? Like Yan Baihu, then who? who? who? Also http://en.wikipedia.org/wiki/File:Wu_region_sun_ce.jpg gives the general area. Is it just the Chapter that's uneditable? That appears to happen if I don't have a marker for that map region loaded earlier – which might happen where the X-Y of the region doesn't match up right. Any idea where the region itself is located in the code? Looks like I'd need to incorporate those maps into the editor to get that function working – that map tile has an effective X-Y of (10, 23). If you can find the actual map section for it in the ROM, I can load that bank in and tack it onto the map (thus allowing map and chapter editing for it). Actually, what would be really helpful for DOAEditor would be 2 things. 2. a new tab that combines the battle and text tab for line openers/closers. Making better mods requires you to edit these puppies a lot, but its a lot of work to manually count through the lines each time I want to edit an opener or closer. 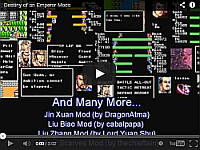 First I check the banks, then search all the lines by typing in random hex values until I stumble upon the one I need, or at least close enough I can start counting by line, its a horrible process atm, but necessary if we want to make more story oriented mods that arent just "To the battlefield, destroy Liu Bei's army!" kind of mods. Getting close to wrapping up the preliminary layout for this chapter. The arrangement of chapters will prevent you from actually leveling up your agility until around the end of chapter 3 which will put players at a slight disadvantage, but it is still doable. Difficulty in this mod is going to be this… Wu was so front-loaded on good generals, that it is going to be difficult to give players a reason to even switch to new party members. Sun Ce really accumulated a lot of talent before even conquering the Danyang area. Hah, well, I'm still trying to learn a lot about Wu history, order of officers, etc. Acquiring some officers may be off if ever so slightly but only to make the game more balanced. Like getting Taishi Ci and He Qi AFTER conquering the 4 counties.